Posted on 29, December 2015 by EuropaWire PR Editors | This entry was posted in Automotive, Germany, Management, Technology and tagged BMW 7 Series, BMW Group. Bookmark the permalink. MUNICH, 29-12-2015 — /EuropaWire/ — 2015 was a highly successful year for the BMW Group and this is confirmed by overwhelming worldwide acknowledgement. This year BMW vehicles won numerous national and international distinctions in categories as varied as innovation, design, sporty flair, quality, sustainability and intelligent vehicle connectivity. The prize-winners in the various categories were chosen by juries made up of automobile journalists, readers of car magazines, international automobile experts and market researchers. Four top ratings in the renowned “International Engine of the Year Award” underscore the BMW Group’s engine expertise. A specialist jury of 65 automobile journalists from 31 countries voted the BMW TwinPower Turbo 3-cylinder in the BMW i8 as the class winner. A second class victory went to the integrated drive system of the BMW i8, and this hybrid drive also won the overall prize. The M TwinPower Turbo in-line 6-cylinder petrol engine in the BMW M3 Sedan and the BMW M4 Coupé also received the award in the 2.5 to 3.0-litre category for the fifth time. What is more, the BMW i8 was voted “World Green Car of the Year” as well as receiving the “Paul Pietsch Prize” awarded by the automobile magazine “auto, motor und sport” for the most innovative technology concept. The BMW i8 was also named “UK Car of the Year” and was voted “most environment-friendly luxury car” by “The Washington Auto Show”. The BMW i3 likewise gained international recognition. In China, the successful electric car was pronounced best compact car as part of the “Best Cars 2015” awards, as well as being voted “Car of the Year” in Australia. In addition, the BMW i3 won the “Company Car of the Year” award presented jointly by the magazine “Firmenauto” and DEKRA. The new BMW 7 Series – more than 20 awards in China alone. 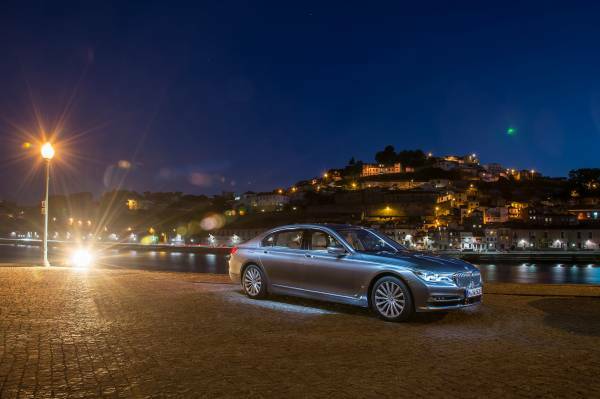 The new BMW 7 Series attracted the most positive response worldwide. In China alone the new BMW 7 Series won more than twenty prizes. These include the “Technology Innovation Award” presented by the renowned “China Business Journal” and “Luxury Car of the Year” awarded by the influential daily newspaper “The Beijing News”. In the USA the new BMW 7 Series received the 2015 “Best of What’s New” award in the automobile category from the magazine “Popular Science” And in Germany the new BMW 7 Series also won the 2015 “Golden Steering Wheel” award presented by “Auto Bild” and “Bild am Sonntag” in the luxury performance category – just as the BMW X1 and the BMW 2 Series Gran Tourer did in their respective categories. The BMW Group’s innovation leadership was also confirmed by 550 body construction experts from 24 countries, who gave the BMW 7 Series the “EuroCarBody Award 2015” for its pioneering body structure with Carbon Core. Outstanding honours for BMW design. The International Forum Design “iF design awards” are among the very highest distinctions for achievements in design. This year the BMW Group won a total of 13 of the highly coveted “iF design awards 2015”.The unique character of BMW design also impressed readers of the car magazine “Auto Zeitung”: here the elegant and sporty BMW 4 Series Gran Coupé won the “Design Trophy” in the categories “Sedans/Coupés/Vans”. In the compact class, it was the styling of the BMW 2 Series Convertible that received the highest distinction. And as the most outstanding design innovation of 2015, the new BMW 1 Series won the “autonis 2015” award as part of the readers’ vote held by the car magazine “auto motor und sport”. Meanwhile in the “Concept Cars” category of the “Auto Bild Sportscars” readers’ vote, a clear majority went to the BMW 3.0 CSL Homage, which was created by the BMW Design Team in recognition of the classic BMW coupé icons of the 1970s. Driving fun with the power to thrill. Sheer driving pleasure is the top priority for readers of sports car magazines – and it is the sporty BMW models that best embody this. This was certainly the opinion expressed by readers of “Auto Bild Sportscars”. In the “Serial Production Coupés” category, the BMW M4 GTS was voted “Sports Car of the Year 2015”. Its 500 hp 3-litre 6-cylinder petrol engine with M TwinPower Turbo Technology is the first serial-production car to be fitted with innovative water injection (combined fuel consumption: 8.5 l/100 km; combined CO2 emissions: 199 g/km)*. * The fuel consumption figures were calculated based on the ECE test cycle, dependent on tyre format. The result of the readers’ vote held by the magazine “sport auto” likewise confirms the sporty aspirations of BMW: in as many as four categories BMW models were placed at the top of the rostrum. For the third time in succession, the BMW 335i received the “Sport Auto Award” in the class of sedans up to EUR 50,000. And for the second time in a row the BMW M3 finished first in the category of sedans/estate cars up to EUR 100,000. The same was true of the BMW M135i in the compact class and the BMW M235i in the ranking for coupés up to EUR 50,000. Recognition of pioneering role in the area of car connectivity. 42,520 readers of the automobile magazine “auto motor und sport” and the computer magazine “CHIP” cast their votes for the “Car Connectivity Award 2015”: in doing so they confirmed the BMW Group’s pioneering role in the networking of driver, vehicle and environment. The BMW i8 was the outright winner of the “Connected Car 2025” award, attracting 30.3 per cent of the votes. The magazine’s knowledgeable readers were impressed with the car’s extensive range of driver assistance systems, services and apps. What is more, 56, per cent of participants regard BMW as the brand with the best car connectivity. Readers of the automobile magazines “Auto Bild” and “Computer Bild” voted on which manufactures offer the best innovations relating to automobile connectivity, for which the winners receive the “Connected Car Awards”. The new BMW 7 Series was voted “Connected Car of the Year”. In addition to its optimum connectivity, the gesture control function and “remote-control parking” were two particularly impressive features which the new BMW 7 Series is the only car in the world to offer. For the “remote-control parking” function, BMW also received the “Connected Car Award” in the category “Assistance Systems – Comfort”. BMW also impressed readers most in the category “Assistance Systems – Safety”, being honoured with the “Connected Car Award” for the “Driving Assistant Plus” system available in the BMW 7 Series, BMW 5 Series and BMW i3. The “GreenTec Award” – one of the biggest and most important European distinctions for environment-friendly technology – went to the intermodal route planner developed for the BMW i models. The system incorporates other means of transport in navigation guidance where this means that the destination can be reached more quickly and efficiently. The BMW Group also received the United Nations “Momentum for Change Award” for its innovative fast-charging network to cater for electrically powered vehicles. Confirmation of sustainability and quality. The car magazine “Auto Bild” determines the “Value Master” based on forecasts made by the German market analysis institute Schwacke relating to the resale value of vehicles. In the category of electric cars, the BMW i3 received the “Value Master 2015” award due to having the highest resale value. For the third time in succession, a BMW 3 Series model clinched this title in the hotly competed category of mid-range cars – this year it was the BMW 325d Touring. There was even a double victory in the compact SUV category: the BMW X3 xDrive35d was the winner, very slightly ahead of the BMW X4 xDrive30d. With its premium quality, reliability and top-class ergonomics, BMW also did well in the “Initial Quality Study 2015”, a survey of 84,000 North American new car buyers conducted by J. D. Power and Associates. The winner in the segment of small premium cars this year was the BMW 2 Series. The BMW 4 Series won in the class of compact premium cars, and first in the category of mid-size premium cars was the BMW 5 Series. J.D. Power and Associates also assess the production quality of automobile plants. The “Platinum Plant Quality Award 2015” for the best plant in the world went to BMW Plant Rosslyn in South Africa. BMW Plant Dingolfing came second in the Europe/Africa region, making it the best automobile plant in Europe. “Momentum Change Award” for establishing the world’s largest fast-charging network for electric cars.